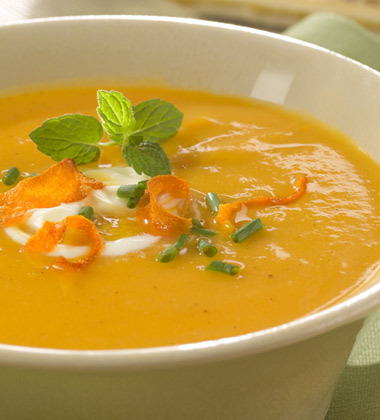 A quick and delicious Fall Favorite featuring Campbells Signature Butternut Squash Soup. 1. In a sauté pan, melt butter and oil together over medium heat. 2. Add garlic and nuts/seeds. Sauté until garlic aroma is apparent but not burnt and nuts/seeds are lightly toasted. 3. Add sage to pan lastly. 4. Pour one 8 oz ladle (1 cup) of thawed soup into sauté pan, warm and let simmer. 5. While constantly whisking, add heavy cream. 6. Season with black pepper to taste. frozen cheese ravioli	 140 oz. 240 ea. 7. Nestle ravioli into sauce. Coat with sauce and continue to cook until ravioli are warmed through. 8. To Serve: Arrange 8 ravioli on plate, pour Butternut Squash sauce over top. Garnish with 1-1/4 teaspoons parmesan cheese and fried sage leaves. Serve immediately. Additional varities of nuts/seed that can be used in this recipe: pine nuts, pecans, pumpkin seeds, sunflower seeds.